Quilting shouldn't be a headache! Solve your tension troubles with these easy tips. "Hi, I'm Jennifer, here with Handi Quilter ambassador Angela Walters. 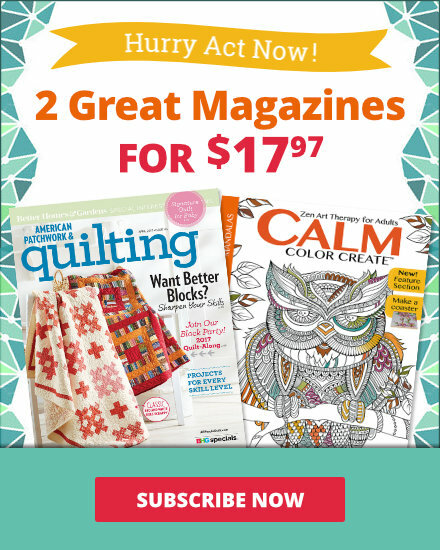 And we're talking about long arm machine quilting and getting your tension right. 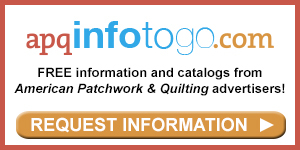 The key to great machine quilting is having that tension balanced, but how do you do that?" "It's actually not as hard as you might think, but before we start talking about that let's talk about the anatomy of a stitch or what it looks like, because once you figure out how it's supposed to look, then that can help you fix it when it doesn't look that way. So, If you think about the top thread and the bottom thread coming together, they form a loop or where they connect. In perfect tension that loop or that point is in the quilt sandwich. So when you have bad tension it's when that point is above the quilt or below." "I think I have the perfect example of that. Now, when I'm practicing on the long arm machine, I tried to do a lot of different stitches and just doing it on a whole quilt. And my secret has been to use the same thread weight, but different colors in the needle and in the bobbin so that I can see if I have my tension adjusted right. So, sometimes I think I'm going along just fine. I've got my purple thread in the needle. And then when I take it out of the machine and turn it over, I'm sometimes disappointed because I see purple on the back and I shouldn't, because I had a different color thread. 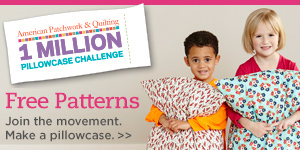 Now, I wouldn't quilt that way, but how do I avoid this?" "That's a good point, and I do have some tips that I like to follow to help prevent tension problems. So one of the things I like to do is always use the same type of thread. So I find it kind of thread that works great in my machine and I just stick with it. So I'll just switch out the colors depending on what I need for the quilt. That's just my personal preference--I know some people like to try different kinds. And I also when I'm quilting a real quilt I'll keep the colors the same, as well, and that will prevent this from showing up as much. Because it's hard to ask a machine that's moving at such high rate and moving in different directions to keep it perfect, so using the same color will help. But this looks like it was a tension problem as well." "Where do we start?" "Well first, one thing I always do is keep the bobbin set. That way, I know if there's any tension problems, I just have to adjust the top thread. So usually what I'll do (and you and you can buy gauge that will help you see if it's the right tension on your bobbin), but I just do a little trick where I hold it. And I'll dangle it from the thread. What it should do is just slightly fall. See how it's not suspended? So every time I use a bobbin with this thread, no matter the color, it's going to be set, so I just know that I need to adjust the top. Now, some people like to use thicker threads, and you can see right here how the tension will come into play. See how it just hangs? That means it's too tight and you'll have bad tension with that. So, you'll want to adjust it. And if you're a fan of using a bunch of different types of thread, you might want to invest in an extra bobbin case, so you don't have to keep adjusting it on the little screw." "And there's a little set screw on the bobbin, and you would just adjust it until you got that just balanced in your hand pulling out smooth." "And once you get that set, then you know if you're having tension trouble, it's because the top tension. So what I would need to do is just loosen or tighten this depending on the tension. So, if you think about your quilt sandwich, if you're seeing the bottom thread come up to the top, it means your top is too tight, because it's pulling that connection point above the quilt. Or visa versa, if you're seeing your top thread through the bottom, it means that your top tension is too loose." "And that was my problem on this sample. I was seeing my top thread coming through to the bottom and I was too loose on top. So, how do I adjust that?" "Well, the great thing about these, it has a little wheel right here, so to tighten it, you just turn it clockwise, and to loosen it, you just turn it counterclockwise. You don't have to do a whole bunch of adjusting--just a little bit either way. And just keep tweaking it until you find the happy spot. "Quilting should be a tension-free experience and one that you can enjoy, so try these troubleshooting tips. 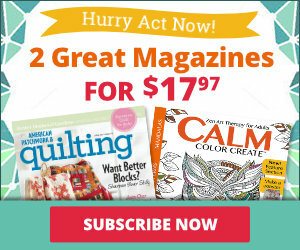 Get that perfectly balanced stitch and you'll be quilting for hours."